Various systems used in a car like Advanced Driver Assist System (ADAS) and Time-Sensitive Network (TSN) typically require large bandwidth to support real-time audio, video and sensor and actuator data communication. These applications are very time sensitive and timestamps of critical events are required with high accuracies and standardized over the complete network. Time synchronization between these nodes is important for inter-node compatibility of these time stamps. We are developing IPs to implement various protocols viz. 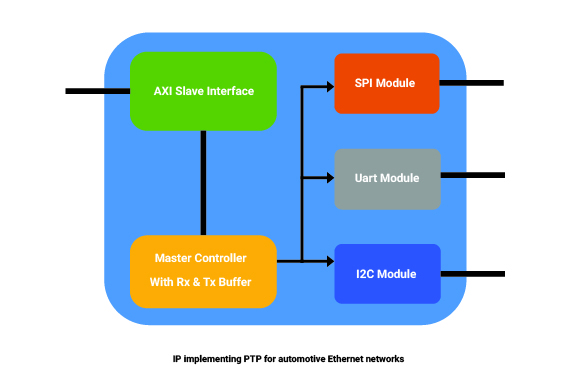 IEEE1588 Precision Time Protocol (PTP), IEEE802.1AS generalized Precision Time Protocol (gPTP) etc, which enable time synchronization between nodes on automotive Ethernet networks. Figure shows a block diagram of the precise time protocol IP being developed.